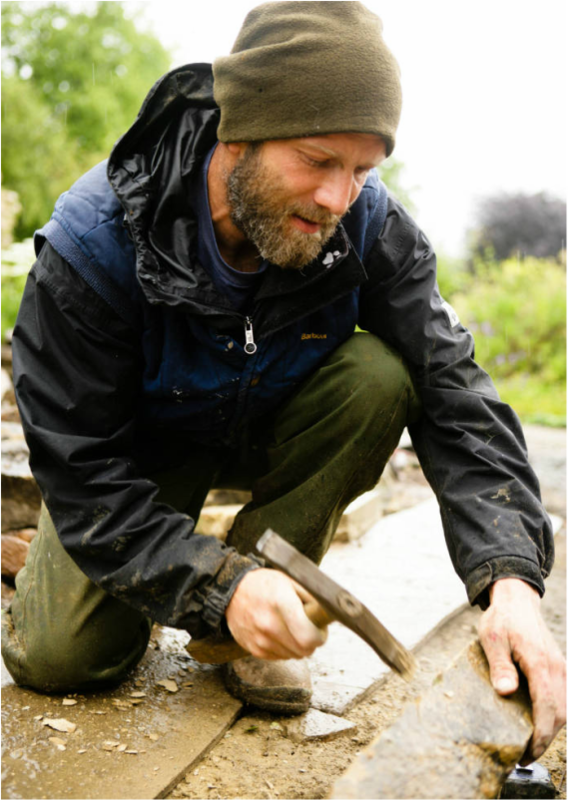 Having completed a Masters Degree in Computer Studies and a Bsc in Construction Engineering in 1999, I quickly realised that my passion lay not in an office, but in the great outdoors where I could be my own boss and be more creative working with my hands. I'd worked in summer holidays with a builder to earn some money and with my Dad, a time served boat builder, so had a good idea of how to use tools. As much by chance as by design I found myself using stone on a lot of my projects; drystone and lime mortar walling, cobblestone driveways, Yorkstone or Caithness flag stone patios. I incorporate fencing, decking, railings, turfing and planting into my work as well as designing and drawing out gardens but the timeless beauty of stonework has become my obsession. I am inspired by the history of dry stone work, which is so rich, from Scara Brae approximately 5000 years old to modern classic works from the likes of Andy Goldsworthy. It seems that the further I go in my career, the further I look back for inspiration. These days I’m really fortunate to be doing something I still enjoy immensely. It can be hard and cold and wet, the stone is heavy and I get covered in mud but when the job is ending and the wall nears a finish, the wet cold days fade and the stonework starts to shine. What a feeling when you build a garden where the structure is in stone. A cobbled drive and drystone raised beds. A stone patio and a pitched stone path creating the structure.... Planting softening the edges and the sure knowledge that my hard work will last for many years.